Farmhand #3 Review – AiPT! Farmhand is one of the most unique comics on sale today. The kids go about the day at school and attend their grandfather’s farm in the afternoon. What should be a routine trip for them falls into utter disaster. Meanwhile, Ezekiel meets an old family friend as readers learn a little bit more about this strange family’s past. One of the most striking elements of this issue is how Guillory plays with the tone depending on the characters present in a scene. For example, for a majority of this issue Ezekiel’s children are the main focus. 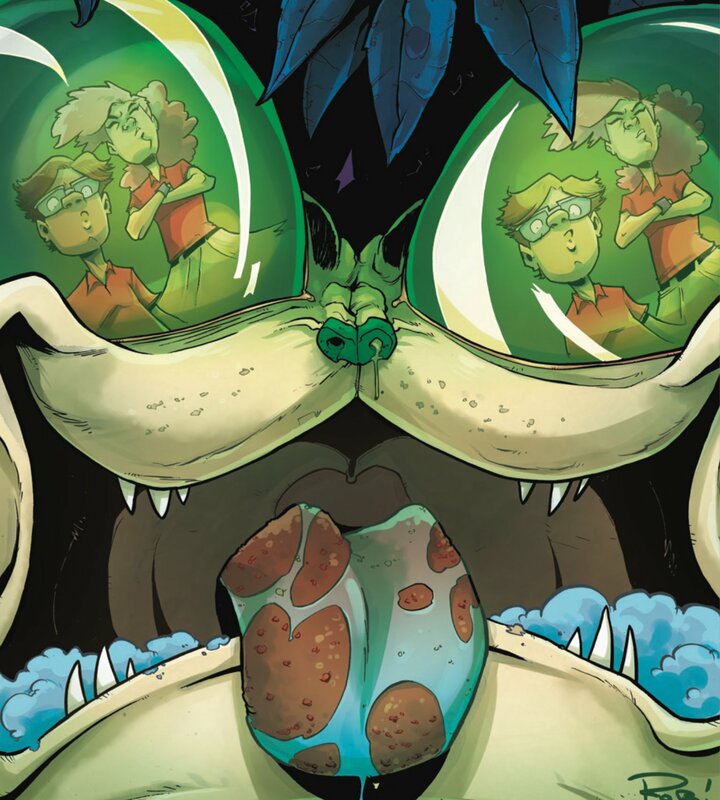 For this Guillory ramps up the humor, specifically using his art style to make it look like an all ages comic. There are a lot of visual gags in the first half of this book and it really makes the story stand out. Not many comic books attempt this kind of tonal control. As the book progresses, the comedy goes from a more juvenile ‘poopy’ style to the gore and shock humor the series has been known for so far. It’s a jarring turn but it reads as if it’s meant to be. The plot of the issue is paced well amongst the characters. While the children are the focus, readers won’t feel like they’re with them too much in comparison to Ezekiel or his father Jedidiah. More importantly when the characters inevitably come together towards the conclusion, everything feels natural. Nothing is rushed here for the sake of plot. When comparing this issue with the two previous, it feels like this has the least amount of action in it. It’s not necessarily a slow issue by any means — it just feels like the focus on the children has led the story to being more cartoony than the last couple. This is a mature story and the jokes with the children are funny, but taking the mature tone away from the book for this many pages is a bit of a let down, especially when there is little payoff. The payoff to the children’s story doesn’t feel as engaging as the ‘twists’ have been at the end of previous issues. The story is still interesting but there’s less of a hook here than usual. Farmhand is one of the most unique comics on sale today. With a distinct vision and voice, Rob Guillory is guiding this series down an incredibly interesting path, albeit with a few hiccups along the way. This is a series worthy of readers’ interest. Despite a couple setbacks this issue, Farmhand is still an original and engaging series. Still an original story unlike anything else.